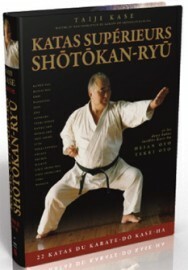 THIS IS THE NEW, REVISED AND EXPANDED EDITION OF THE CLASSIC BESTSELLER "18 Kata Supérieurs, 20 superior Shotokan Ryu kata are presented in this book including the original version of Wankan. Additionally for the first time published the kata Tekki Oyo and also the kata Heian Oyo, both created by master Kase himself! "22 KASE HA SHOTOKAN RYU KATAS": Kanku Dai, Bassai Dai, Enpi, Hangetsu, Tekki Nidan, Jion, Jitte, Gankaku, Kanku Sho, Bassai Sho, Nijushiho, Jiin, Tekki Sandan, Chinte, Sochin, Meikyu, Gojushiho Dai, Gojushiho Sho, Unsu, WANKAN, HEIAN OYO, TEKKI OYO. Forms and applications (bunkai) plus Kase Ha key points and principles.